With a complete management and design service, we oversee each project with a focus on quality, safety and customer satisfaction. As part of our complete sports pitch service for clubs and organisations around the world, we offer a comprehensive design and project management services. Let us take control to deliver the best pitch. At SIS Pitches, two of our core values are quality and customer satisfaction. That’s why we oversee every project with a complete focus on quality, safety and customer satisfaction at every stage. Our site supervisors control each project on site, and report to our regional Contracts Manager to ensure full quality is assured. Our project management team works hard to find solutions to any problems that arise, and present a variety of options and costs to you before we proceed. On every installation, quality and safety are our two biggest drivers. We are proud of our proven record of zero defects, and strive at all times to meet stringent safety requirements. 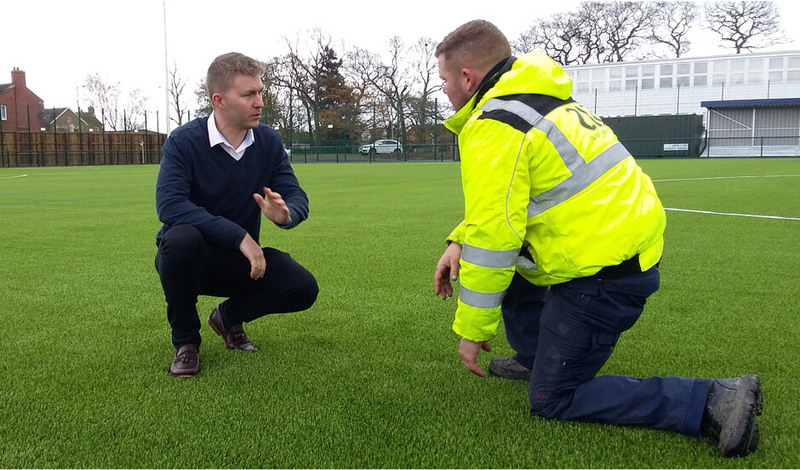 What’s more, we carry out quality tests at key stages – formation, stone, blinding or tarmac layer, after-pad installation, as well as a full pitch inspection on completion. To make sure that you are completely satisfied with the finished project, our site supervisor and site officer do not leave your site until all work is completed. We put together an expert team to design a pitch which meets the needs of the relevant sports governing body and enhances your sporting performance. SIS Pitches have acquired a wealth of experience and expertise in designing a variety of pitches, and understand the strict requirements which have to be met. We know that satisfying the local authorities and planning department, and meeting the criteria for planning permission is absolutely key. That’s why we employ experts to prepare all of the relevant documents and surveys ready for submission. As you would expect, all pitches have to be designed in accordance with the relevant governing bodies including FIFA, the Football Association, the Federation of International Hockey, Sport England, World Rugby, the Rugby Football Union and the Rugby Football League. Once we have approval, we will carry out the initial site surveys and preliminary planning, looking into feasibility, ground investigation, topographical surveys, planning advice, drawings and drainage testing. We may also commission other surveys, if required, to investigate environmental issues, habitat, noise, flood risk assessment and so on. The result of all of these reports will form the basis of our project design, which will be undertaken by our in-house experts and external consultants.